Despite its small size, the Norfolk spot is one Virginia’s most popular saltwater fish species. Although spot begin arriving in late spring, the best fishing usually occurs in late summer through fall. In Virginia, spot are caught in nearshore waters of the Atlantic Ocean, coastal bays, the Chesapeake Bay, and tidal rivers. Spot are caught at fishing piers, jetties, the surf, bayside beaches, and from boats. 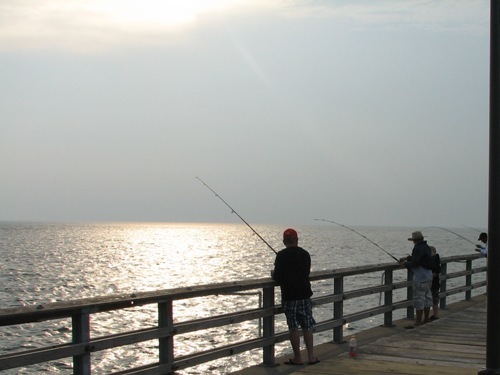 Popular piers for spot fishing include the Little Island Park Fishing Pier (Sandbridge), Lynnhaven Pier (Virginia Beach), Virginia Beach Pier (Virginia Beach), Sea Gull Pier (Chesapeake Bay Bridge-Tunnel), James River Fishing Pier, Buckroe Beach Fishing Pier, Ocean View Fishing Pier, and public fishing piers along Virginia’s eastern shore. Spot are caught along Virginia’s Atlantic coast, from Sandbridge up to Assateague Island. In Virginia, spot are caught in nearly every location where surf fishing is possible. They are also caught along jetties and inlets, such as Rudee and Lynnhaven inlets in Virginia Beach.